Effective States » What is ESID? The Effective States and Inclusive Development (ESID) Research Centre is a global partnership investigating the kinds of politics that promote development. Funded by DFID, our research spans 16 countries and we have research partners in Bangladesh, Ghana, India, Malawi, Rwanda, South Africa, Uganda and the USA. ESID is deepening the understanding of governance in the developing world in ways that impact on policy and practice so that people’s lives and livelihoods are improved. We are helmed at the Global Development Institute (GDI), Europe’s largest global poverty and inequality institute. Under what conditions do developmental forms of state capacity and elite commitment emerge and become sustained? In particular, what role do power relations and ideas play here? 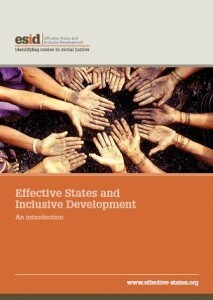 Download Effective States and Inclusive Development: An Introduction (pdf).